Emergent Baptists are those who believe there is more to God, Jesus, and God’s kingdom than modern Christianity and its denominational categories have been able to define. Emergent Baptists believe it is incumbent upon us to participate in—and write—the narrative for our time and place. Like generations before us, we hope to take what our forefathers and mothers gave us and fashion something from it that is our own. This book contains some of our first efforts at doing so. Zach Roberts (editor) lives in Raleigh, North Carolina, with his wife, Jenn, and their two children, Landyn and Harrison. With degrees from Bluefield College and Southwestern Baptist Theological Seminary, Zach will complete his D.Min. in Gospel & Culture at Columbia Theological Seminary in 2010. He is currently the Associate Pastor for Education at Ridge Road Baptist Church in Raleigh. Baptists – Southern, American, South American, Australian, Kiwi, Canadian, European, etc. – have played a quiet but pivotal role in the emergent conversation since the beginning. Meanwhile, some of their fellow Baptists have positioned themselves as outspoken antagonists of all things emergent. That’s one reason this collection of essays is so important: it makes clear that in spite of a vocal opposition, there is also a growing chorus of creative and constructive Baptimergent voices. The uninformed, the opposed, the interested, and the already-involved will all find a rich combination of education, inspiration, provocation, and stimulation in these pages. This collection of “Stories from the Emergent Frontier” is not only passionate and informing, but also precedent setting. For the first time, emergence Christian leaders from a single faith tradition within Christianity have turned and, in love, affection, and devotion, addressed their denomination itself about who and what they are as dwellers within the dual context of emergence Christianity and a denominational loyalty. What they have to say matters to all of us. The time has come for particular confessional tribes within Christianity to reflect on what the burgeoning emergence of the church means to them. Baptimergent is an excellent model of what that reflection can be—plus it’s got chapters by some of my favorite people in the world. 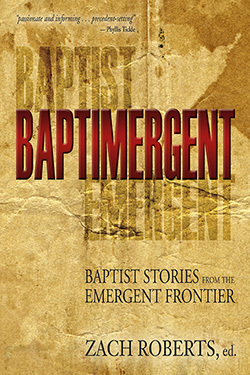 This is a great resource for Baptists and non-baptists.